This is really all about my new domain name. When Mark and I first tried to come up with a name, it was for his fused glass business. We were planning to tap into the quilting community and eventually vended quite a few quilt shows in the process. We wanted his business to have a kind of generic theme that would relate to quilts but not be too restrictive. And that is how Around the Block Designs was born. This was the only logo I could find--interestingly we didn't ever actually do gift certificates. Weird. We got to the point where we had a website and wanted to also have an etsy shop. Etsy had a rule about shop names not exceeding 20 characters. Around the Block Designs is 21. So we dropped the "s". If you typed the name in the etsy search bar but included the "s" it would say there was no shop by that name. Confusing. Especially since everything we purchased as part of branding the business and building our booth had that pesky "s". And then I started blogging. But I felt like Around the Block Designs was not a really "interesting name" for blogging purposes and wanted something catchier when I left comments, something that would make people think, "Hmmmm... wonder what that person is all about." So that's how "Live A Colorful Life" was born. This was my blog header for quite awhile because we were still combining the ideas of fused glass and quilting. I had this one for awhile. It was fun. But still not "me." And then I discovered Julia at Little Girl Quilts. She lives in Berlin! And with back-and-forth emails over the course of a week or two, she came up with this fabulous design. I still love it! But here's the problem. When I registered with Blogger, it was as "aroundtheblockdesigns.blogspot.com." A couple of my things have been published in magazines and so that was the contact information that would go along with the articles, and it's really hard to make the connection between that and Live a Colorful Life. And that particular blogspot URL is unavailable. In fact, this is the message you get when you type it in. 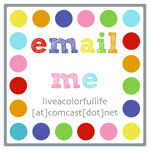 Sorry, the blog at liveacolorfullife.blogspot.com has been removed. This address is not available for new blogs. Big bummer, in my opinion. I decided to break down and buy my domain name. But the .com version was already taken. Back and forth I went with decision making. I finally ended up with the .net version. Then back to Blogger to have it redirected. And this is where the naked and non-naked comes in. Sorry, the blog you were looking for does not exist. However, the name aroundtheblockdesings is available to register! Do you see the problem there? Like who would even want to register a name that has the word "designs" misspelled? Either way, I just hope you find me! Hi Cindy, if you're considering switching to self-hosted Wordpress, I'd be happy to point you in the right direction. Though it is not free (you have to pay for hosting yearly), it is amazingly user friendly and I've helped others with it too. Let me know if this is something you'd like more info on! Hi Jennie! I think there could be many of us who are interested to learn more about self-hosted Wordpress. Any chance you could write something in your blog? I'm your follower. Thanks! Very interesting story, indeed! And very strange - I wonder if it's a .net related issue, because most of the other Blogger redirects that I read (including my own) I type in without the WWW and get to them a-ok...hmm...anyway, congratulations on your .net upgrade, that's really exciting!! Well I've found you here? I had similar nightmares changing my name. Just FYI, I am reading from your .net right now and I didn't do anything different from normal to read your site. Glad to see you here, or where ever. www is not a bad thing! Still following! I've wondered myself what's involved with making a switch like that. Thank goodness for readers -- I've had no trouble finding you there! How fun to hear your story! I will chase you down no matter where you end up!! Hi! Fortunately I found you - you are 'normally' in my Bloglovin! 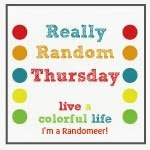 All that sounds very confusing - I can't believe I have made my blog alone and had to 'fix' something to that I have the same address with the name because first I signed in with a name I didn't really choose and thought I can change it later. This doesn't sound right at all, especially the misspelled "design" part. It sounds to me like a typo in the non-www entry is causing this problem, because it IS sending you to blogger, just to the wrong blogger subdomain. How did you set up the URLs? If you did them via DNS, check if you have two entries, one for www and one for non-www. If you do, you should simply make the non-www one go to www, that way they're definitely going to the same place. If you did it within Blogger somewhere, same thing, check that if there are two settings, that they match. Huh, this is very odd - like Elizabeth said, my domain redirects even if you don't type in the www. So I wonder why they won't let yours do it? Well, at least you have your Life a Colorful Life domain now! Good luck straightening it all out! Oh Cindy, all this talk makes me itchy- I hate computer stuff! UGH! I found you no problem though, same way I always have- don't know what that means- but I found you! Hope some of these super smart commenters can help you out- sounds like it could be fixable? Fingers crossed for you! I used to blog as celebrationsbellydance.com. Then I changed my name to nitadances because I was blogging about so much more than dance, but I didn't want to loose the "dance" because of my dancer followers. NitaDances seemed the perfect solution. I use wordpress but am hosted by tutshi.net. "My guy" at Tutshi put a re-direct on my old celebrations site, so when people go there they are sent to my NitaDances site - simple as that. After 2 years, I let the old name go. oops...that should have been http://www.tutshiweb.com/ not Tutshi net. Sorry. (sorry, no part 2). In my case, the best solution was to "Forward the address". If someone asked for it naked, my registrar would go ahead and make put the .com (in my case) on the URL before sending it to google. But really, booo to domain name troubles! Ick. This is making my head hurt. :( I hope you get it figured out soon! You're in my blogroll already, so I'm not leaving and you can't make me! I follow you on Bloglovin' an since that works for me, I am still able to follow you easily. I know you will get it sorted out. Lots of savvy folks out there to help you.